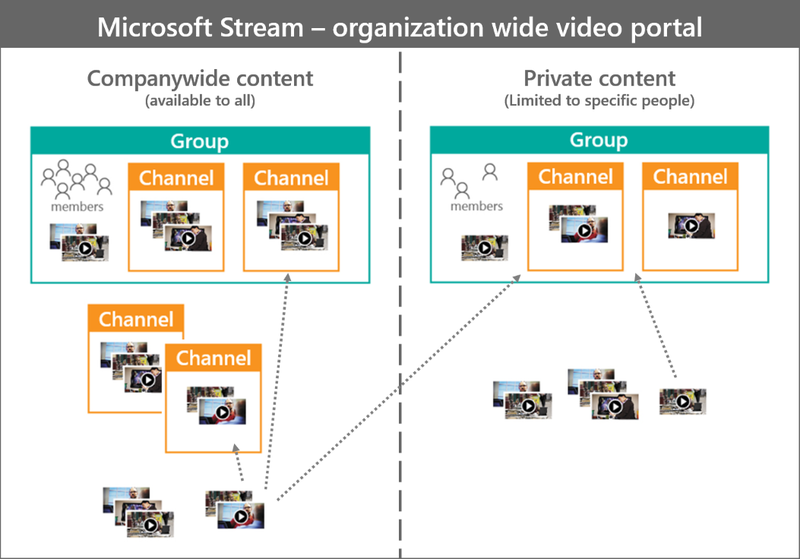 With the combination of organization-wide channels and groups in Microsot Stream, you can set up an area to organize and permission your videos to match your needs. Use the ideas in the provided scenarios and examples for potential strategies to use to organize your videos. 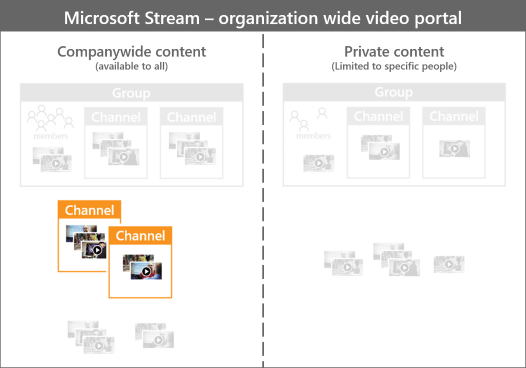 Groups in Stream are built on top of Office 365 Groups. When you make a group in Stream, it creates a new Office 365 Group that can be used across Office 365, giving the group an email address, calendar, site, etc. 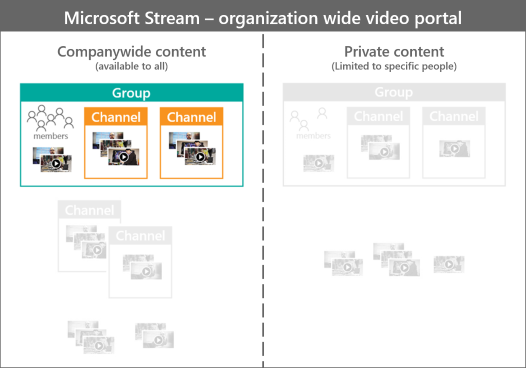 If you already use Office 365 Groups in your organization from Microsoft Teams, SharePoint, Yammer, Planner, etc, you can start using those groups in Stream right away. Channels are an organization method for videos, but not a permission method. Channels don’t have any permissions on their own. Use a public group, if you want to make an area in Stream that is for top down knowledge sharing from a few people within the organization. You can also use a public group, if you want to make an area in Stream that is for a team, department, or group that is okay with people outside the group seeing their videos and joining the group. Use a companywide channel, if you want to make an area in Stream that is for companywide community driven organization of videos by topic. NOTE: If you don't want users to create companywide channels, see Restrict companywide channels for information about how to set who can to create companywide channels. Only videos with Allow everyone in your company to view this video checked can be added to this channel. Everyone in the company can see videos in this channel. Everyone in the company can add/remove videos to/from this channel. No second-level organization of videos within this channel. Use a private group, if you want to make an area in Stream that is for a team or department that wants to do top down knowledge sharing from a few people within the team or department, but only to those in the team or department. Only members of the group can see videos and channels in this group. Owners have to approve and/or add new members to the group. Only Owners of the group can upload/edit videos. You can further organize videos by adding channels within the group. 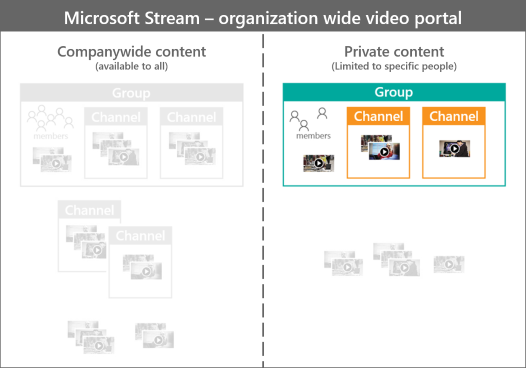 You can also use a private group, if you want to make an area in Microsoft Stream that is for a team or department that wants a collaborative space for people within the group. Only members of the group can see videos in this group. Both Owners and Members of the group can upload/edit videos.